AllegroMedical.com presents The Laydry Absorbent Bed Pads For Adults . LayDry's patented SuperCore technology coupled with a breathable back sheet make sure you stay dry all night long. This product is also latex and binder free – for happier and healthier skin! 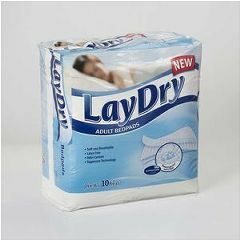 With LayDry the user can regain a good night’s sleep without worries because they stay totally dry! LayDry is clinically proven to reduce pressure ulcers. Superior wicking and fluid distribution for no puddling!